A new phase of construction began in December 2003. Two rooms totalling about 600 square feet are being added to the front of the house, with a large square window facing the pond to the west of the house. A studio building is also being built. The image to the right shows the concrete pouring operation which took place on a cold day in January. 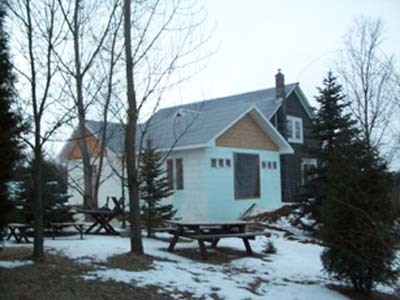 The house addition and the new studio were poured that day. 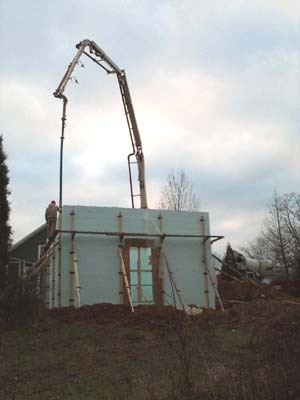 The ICF (insulated concrete form) consruction method involves stacking Lego-like hollow polystyrene blocks, then pouring concrete into their core forming a solid wall with 2 inches of insulation inside and out (about R-50).